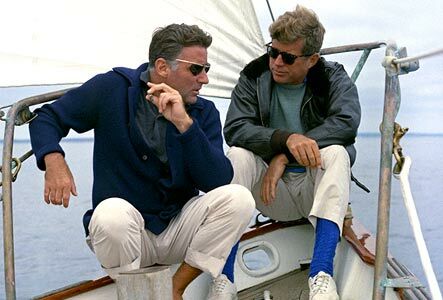 JFK with brother-in-law, actor Peter Lawford, 1962. One of the greatest benefits of the NFL concussion litigation is actually outside of the proposed settlement. Since the first concussion case was filed against the NFL in 2011, awareness of brain injuries as a result of sports activities has grown tremendously across many sports at many levels. Discussion of the science of concussions, concussion prevention equipment and techniques and concussion treatment protocols has become commonplace. In August 2011, personal injury attorneys Larry Coben and Sol Weiss filed the first concussion lawsuit against the NFL on behalf of former players. Since then, attorneys have also instigated sports concussion litigation involving the NHL, NCAA, soccer and cheerleading. The first NCAA lawsuit, filed in September 2011 by attorney Steve Berman actually covers college athletes in seven sports: football, wrestling, basketball, field hockey, ice hockey, lacrosse and soccer. In addition to being the lead counsel on the NCAA concussion litigation, Berman recently filed a lawsuit against FIFA, the international governing body of soccer, and other U.S. soccer organizations. The enormous popularity of the NFL has helped propel awareness of concussions and of the concussion litigation. According to Nielsen Media Research, during the fall of 2013, the top 20 most watched TV shows in America were all NFL football games (of those 20 games, the Denver Broncos and the Dallas Cowboys combined to be in 14 of them). Equipment manufacturers have also jumped into the fray, offering all kinds of new gear to help reduce the impact of concussions. Improved mouthguards, and new helmet designs have been developed and marketed to the millions of football players at all levels of play. Unfortunately, some researchers have indicated that new equipment is not reducing the incidence or severity of brain injuries. Testing to improve the fast and accurate diagnosis of a concussion has also been given a boost by the NFL litigation. Even NASCAR mandated baseline concussion testing for all of its drivers in 2014. Numerous types of baseline testing and neurocognitive tests have been developed and brought to market. The last 3 years have seen a tremendous rise in the public’s awareness of sports concussions and brain injuries. Regardless of the merits of the NFL settlement, there’s no arguing that head injuries in sports will never again be looked at, shrugged off or minimized like they were prior to the NFL concussion lawsuits.